Ethiopian has gained the early upper hand over its neighbouring rival Kenya Airways in the race to become the biggest carrier in Africa over the next decade or so. Both airlines launched ambitious, once in lifetime, growth strategies since the Global Financial Crisis (GFC) which they hope will deliver dominance over the other and their geographically advantaged East African hubs. Ethiopian came through the GFC relatively unscathed and with its record of 12 consecutive years of profits intact. The carrier stated in Jul-2013 that it expects to report a record profit for 30-Jun-FY2013 driven by a 20-25% increase in revenue and passenger numbers, despite disruption caused by the three month grounding of the 787-8 fleet due to issues relating to the aircraft's batteries. In contrast Kenya Airways slumped to a USD92 million loss after tax in the financial year ended 31-Mar-2013, as the European economic downturn drags on and geopolitical uncertainty surrounded a number of general elections in Africa, including in Kenya, which caused a sharp drop in demand. Kenya Airways responded by launching a turnaround strategy in 2HFY2013 including restructuring its network to reduce exposure to loss making routes and a focus on expanding in Southern Africa and on eastbound intercontinental routes. It also moved to reduce its ballooning wage bill by shedding hundreds of jobs. And external factors, a constant threat to the airline industry, intruded when least needed. A fire which destroyed Nairobi Airport’s international terminal on 07-Aug-2013 is likely to impact on Kenya Airways profit for 1HFY2014 due to extensive service disruptions in the first week following the fire, reducing revenue by an estimated USD4 million. Operations are gradually returning to normal at the airport as temporary terminal facilities are put in place. But this is hardly the best scenario for an airline that seeks to expand its hub operations. Despite the financial turmoil of recent years Ethiopian and Kenya Airways remain among the few consistently profitable African carriers, but Ethiopian has outperformed its nearest rival since the start of the GFC in 2008. Over the past five years Ethiopian has reported cumulative net profits of USD423 million compared to just USD8 million reported by Kenya Airways due to two substantial losses including the FY2013. Ethiopian made strong profits in FY2009 and FY2010, reducing sharply over the next two years, but is forecasting a record profit for a yet to be announced FY2013. The financial results are indicative of what appears to be a widening gap in the fortunes between the carriers. Much of this is being attributed to Kenya Airways’ high wage bill and difficult industrial relations situation, as well as Ethiopian’s superior network; a degree of government protection also helps. While Ethiopian managed to persuade its workforce to accept a pay cut in 2012, Kenya Airways is still fighting its unions in the courts over the dismissal of 447 workers in 2012, as part of cost reduction measures. Kenya Airways’ wage bill more than doubled in the last six years to USD156 million in the year the year to Mar-2012 while staff numbers rose by 16% to more than 4800. The average wage at the airline was USD32,333 which is about double the average wage Ethiopian pays its 6300 strong workforce. Ethiopian has a more balanced and significantly larger route network of the two carriers with a total of 82 non-stop destinations covering Africa, the Middle East, Asia, Europe and North and South America. That compares to Kenya Airways’ more limited global coverage, offering a total of 54 destinations covering Africa, the Middle East, Asia and Europe. Ethiopian has been more aggressive in pursuing key growth markets such as Asia and South America rather than, until recently at least, in Africa. This is demonstrated by Ethiopian earning 37% of its revenue from Asia and the Middle East in FY2012, compared to Kenya Airways which earned just 20% of its revenue from that region in FY2013. The effect of Ethiopian’s greater Asian presence is further demonstrated by Kenya Airways relying on its African regional network for about half of its revenue compared to about a third for Ethiopian. This is despite Ethiopian operating to 39 African destinations outside Ethiopia while Kenya Airways services 38 regional points, according to Innovata. Both carriers derive 6% of their revenue from domestic operations even though Ethiopian’s domestic network of 15 destinations is three times the size of Kenya Airways’. While Ethiopian flies to eight points in the Middle East and nine destinations in Asia Pacific, Kenya Airways operates to just three destinations in the Middle East; Abu Dhabi, Dubai and Jeddah and five in Asia Pacific including Delhi and Mumbai in India as well as Bangkok, Guangzhou and Hong Kong. Ethiopian extended its long haul advantage in Jul-2013 by launching services to South America on 01-Jul-2013 using 787-8 aircraft operating Addis Ababa-Lome-Rio de Janeiro-Sao Paulo-Lome-Addis Ababa three times weekly. The schedule also connects conveniently with its Addis Ababa-Guangzhou service, allowing Ethiopian to connect all three high growth regions of South America, Africa and Asia. But Ethiopian’s recent Asian expansion elevates it to a tough level of competition and it has not been all smooth sailing. Plans to add Singapore to its Asian network appear to have come unstuck with the carrier cancelling a proposed three times weekly tag service from Bangkok to Singapore which had been due to commence in Sep-2013. Singapore is, however, still being promoted on Ethiopian’s homepage as “coming soon”. Originally the Singapore route was to operate non-stop as a codeshare with Singapore Airlines (SIA). Ethiopian and SIA currently codeshare on the Singapore-Dubai-Addis Ababa route with SIA operating Singapore-Dubai and Ethiopian operating Dubai-Addis Ababa. The two carriers have discussed a broader partnership since Ethiopian joined the Star Alliance in late 2011, including potential cooperation on non-stop services between Singapore and Addis Ababa. However, the biggest obstacle to making a direct Addis Ababa-Singapore 787 route viable was the onward connection time to Australia. Ethiopian had a 3pm arrival slot at Changi which would have meant a six hour layover for connections to SIA’s Australian flights. The 3pm slot did, however, fit well with onward Asian connections on SIA. Under the original proposal SIA would have placed its code on Ethiopian’s new Singapore services and Ethiopian would have placed its code on SIA services to several destinations in Australia. Ethiopian could potentially access Australia via Bangkok or Kuala Lumpur, which it already serves, but its preference is to flow Australia-Africa passengers via Singapore. Ethiopian also launched four times weekly one stop services to Seoul via Hong Kong in Jun-2013. But a second three times weekly tag from Hong Kong to Manila, due to have started in Jul-2013, has been cancelled along with Ho Chi Minh City, which had been due to operate as a tag to the Addis Ababa-Bangkok service. The airline received a sixth 777-200LR in Jul-2013 which it intends to use to open more direct long haul routes, though no specific details on which routes the aircraft will be deployed have been given. The current 777-200LR fleet is used on direct services to Washington DC, Toronto, Beijing, Guangzhou and Rome, as well as several larger intra-Africa routes. 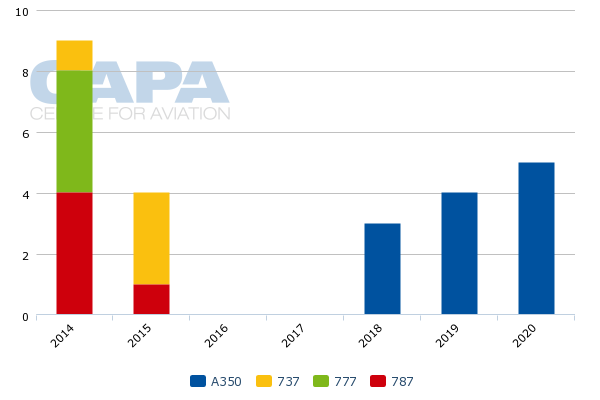 Ethiopian has orders for another 27 aircraft to be delivered by 2020 including A350s which have reportedly been earmarked for long haul route expansion. Ethiopian plans to close Kenya Airways’ African feed advantage by opening new regional hubs and subsidiaries. It has announced plans for a new subsidiary to be based in the Democratic Republic of Congo (DRC) to secure more central African transfer traffic to Addis Ababa. Ethiopian already has a presence in Western Africa through ASKY, which is expanding its regional network. In Jul-2013 Ethiopian took a 49% stake in Air Malawi in south eastern Africa, as part of a joint venture with the Malawi Government and Malawian private investors to relaunch the national carrier. Ethiopian will also provide two aircraft to launch Malawian Airlines as part of the deal. Ethiopian CEO Tewolde Gebremariam points to the JV as a model for the type of cooperation that is needed among African carriers and states to develop an indigenous aviation system that is able to compete with foreign carriers. Foreign carriers account for about 80% of intercontinental traffic to and from Africa. While Europe still accounts for a little over half of inbound and outbound traffic, it is the Gulf carriers that are rapidly increasing their presence on the continent, leveraging their strong Asian links. Mr GebreMariam believes African carriers must try to win a 50% share of the continent’s intercontinental traffic to compete. This is a tough ask considering the small scale of even Africa’s biggest carriers in the face of some of the world biggest such as Emirates. Kenya Airways has meanwhile focused on expanding its virtual reach through substantial codeshare agreements. The carrier reached a partnership deal with Etihad in Feb-2013 under which the carriers will place their codes on each others' services between Nairobi and Abu Dhabi. Kenya Airways gained access to 32 destinations on Etihad’s global network including across North Asia, South East Asia, the Indian sub-continent and Australia. In return, Etihad gained access to Kenya Airways’ onward services from Nairobi to 27 destinations across Africa. The agreement was expanded further in Jun-2013 to give Kenya Airways access to 38 Etihad points. In Asia, Kenya Airways has expanded its codeshare agreement with fellow SkyTeam member, China Southern. Among the new routes covered are some services to Australia including Guangzhou-Melbourne, Guangzhou-Perth and Guangzhou-Sydney. In return China Southern will codeshares on Kenya Airways' services from Nairobi to Guangzhou, Johannesburg, Lagos and Lusaka, effective 01-Aug-2013. An example of the pervasive role of the Gulf carriers as they evolve, Kenya Airways lost its codeshare link to Australia on Qantas from Bangkok when Qantas formed a global alliance with Emirates. Kenya Airways is pursuing an aggressive and ambitious 10-year growth plan launched in 2012 which revolves around building its Nairobi hub as an African gateway for traffic to and from Asia, particularly China as well as India. It includes a target of flying to every African capital city by 2014. The long term strategy calls for 60 new destinations in 32 countries and a tripling of the fleet to 107 aircraft, almost half widebodies. This requires Kenya Airways to launch its first services to North and South America as well Australia by 2017 and would make it one of the few airlines to service every inhabited continent. Kenya Airways has 11 aircraft on order, including nine 787-8s for delivery out to 2019. The ambitions of geographically well-positioned Ethiopian and Kenya Airways are testament to the enormous economic potential of Africa and represent a one-off opportunity for the airlines to claim a position as true global network carriers, redressing the imbalance between foreign and African carriers serving the continent. Kenya Airways has restructured its network and workforce in the past year to hopefully set it on a course to resume its long term record of profitability and ensure it remains on track to meet its global growth objectives. Kenya Airways has the support of a strong equity partner in KLM which owns 26% of the carrier, while codeshare partners Etihad and China Southern provide virtual network depth and valuable traffic feed. In the meantime, however, Ethiopian Airlines will retain the upper hand with its superior network coverage in key growth regions while it also leads the charge across the Atlantic. Ethiopian also has the benefit of a protective government which ensures it remains the dominant player at its Addis Ababa hub. Eventually, however, this will become a constraint on the growth of both Ethiopian and Addis Ababa as their fortunes are largely linked. Addis Ababa’s future as a regional hub is dependent on Ethiopian’s growth, but without more foreign carrier capacity at its hub, Ethiopian will miss out on feed traffic that Kenya Airways benefits from at its more liberalised Nairobi base. 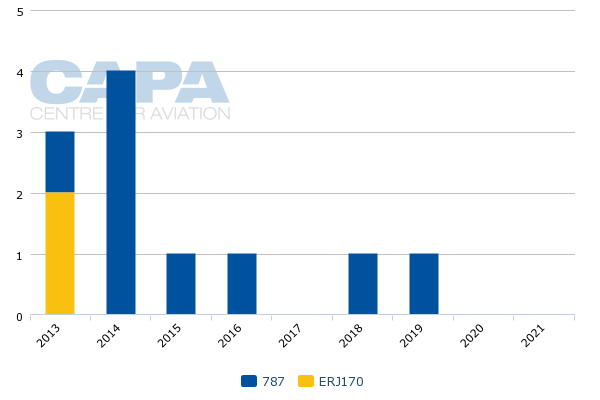 As the global aviation environment becomes increasingly liberal, the opportunities for the continent's airlines to expand internationally will bump more and more up against the growing might of Middle East and eg Turkish carriers - just as they did against the European hub carriers in the past. The saving grace for Ethiopian and Kenya Airways has been that they in turn could aggregate intra-African sixth freedom traffic flows around their hubs. Yet even here they are now finding that many of their collection points are beginning to receive direct services into the more northerly hubs, effectively drying up their upstream supply. Kenya Airways has already engaged heavily in partnerships, with Etihad codesharing as well as its KLM ties; Ethiopian must also be a candidate, meanwhile keeping its options open as it expands, still profitably.